Overall H x W X D mm. 1025 x 455 x 605. Being able to reach the top shelf of a cupboard or bookshelf easily is important, but you will most likely require some steps to help you do this and prevent you from overstretching. 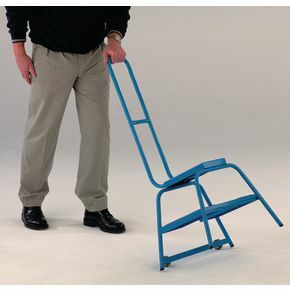 Our wheel along low level step is a great choice to help you in the workplace or at home. They can be easily moved when tilted due to the wheels on the base and the hand which prevents the need to bend. They are static steps when standing on the floor, providing stability to the user. The top tread height is 510mm, making it a lot easier to reach high up areas. There are two tread materials to choose from; anti-slip PVC or rubber and a choice of four colours; blue, grey, red or yellow. Our wheel along low level step is a great addition at home or in the workplace helping you to easily reach higher than ground level areas. They come with a 12 month guarantee and FREE UK Delivery.